Last week I started my first in a set of posts looking in to ways to start a money making blog. 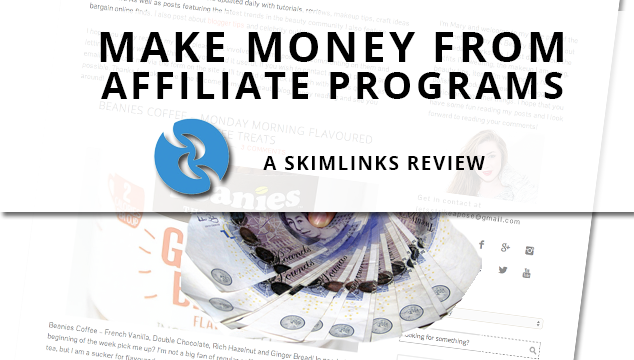 This week I look one of the most well known affiliate programs in the UK, Skimlinks. This post will look at what Skimlinks is, how it works and most importantly how much you can earn. My review of Skimlinks is based on the fact that I have been a user of it since this blog started going last year. I have also discussed it with many other bloggers in the past at meet-ups and its normally one of those sites you should be using if you’re not already! Skimlinks is a affiliate program. Affiliate programs allow you to make a little money from your blog post if anyone buys a item that you link to. You are able to look at 100’s of websites across the internet and find out if they are part of the Skimlinks program. If they are part of the affiliates campaigns you can earn a flat fee or a percentage if people buy that item. Not all programs cover every site, you will have to find out if Skimlinks supports the sites you link to. There are plenty of affliate programs out there, but Skimlinks in my opinion are one of the best as they have a really great plugin for chrome that makes finding out what you can earn and on what sites a breeze. The tool also gives your sharable links, so that you can even make money from tweeting about items and sharing on Facebook (cool right?). How do I join Skiminks? Its super easy and really fast, although you are going to have to wait a few days (2-3 days) to find out if you are eligible to join Skimlinks. Just head over to their Signup Page enter all your details, then wait. As long as you have been blogging a while they will normally accept you, if not will Skimlinks give you quite a detailed reason in to why not. Skimlink comes in to two parts, Skimlinks & Skimwords. Skimlinks turns all your links into affiliate links, you just have to make sure that they go to the right products and Skimlinks will convert all your old and new links over to the Skimlinks program. You don’t have to do anything else other than copy some code in to your blogs theme. If you would like a post covering how to do this please leave it in the comments below. Skimwords, looks at your post and turns words in your posts to links for products, these are a little more spammy in my honest opinion but do sometimes have a purpose. I personally don’t like them but it can be a good money maker. Has anyone ever had experience with Skimlinks? what are your opinions on affiliate programs? If you found this useful please share and link on the social media community !